Spring is here! For many of us, this means a relief from the cold, dark days and snows of winter. As the days lengthen and get warmer, we are greeted by the rebirth of the earth itself: bulbs come up and bloom, filling the air with their heady, tempting fragrance; birds chirp and sing as they return from their winter migrations to build their nests; cats yowl out their urgent readiness for motherhood. All around us are symbols of fertility, growth, warmth and light. It is the perfect time to throw a May Day party or Beltane Festival, to celebrate the end of winter hibernation and to reconnect with your friends and loved ones. Beltane is an old Celtic Fire Ritual which celebrates, at the most fundamental level, the end of winter and the beginning of the warmer, lighter half of the year. It is the counterpart to Samhain, which marks the Pagan New Year and celebrates ancestors and the death of the crops (harvest). Beltane celebrates life. For the Celts, it was a festival that insured fertility and growth. Beltane is one of the four major Sabbats in the Celtic tradition, the other three being Lammas, Samhain and Imbolc. Beltane's traditional date, May 1st, was chosen as the midway point between the vernal equinox and summer solstice (two of the four minor Sabbats). Due to the change in the earth's axis of rotation over time, this point is now closer to May 5th, and some pagans observe May 5th as "Old Beltane," but the traditional date is still favored. Beltane, much like Samhain, has changed over the years. Some traditions existed only in a single village, while others were found throughout the culture. It is believed that Beltane is a Celtic reinvention of an even older Roman festival, Floralia, which celebrated the goddess Flora and the flowering of spring. Most major religions have a holiday that marks the coming of spring. The Christian religion celebrates rebirth (or resurrection) on Easter; Easter eggs, Easter bunnies, chicks, and lilies are all pagan symbols of fertility associated with spring, adapted to the Christian tradition. The Hindu religion celebrates Holi, a carnival-like spring festival, dedicated to Krishna or Kama, the God of Pleasure. This festival resembles Beltane, with bonfires being a main focus of the holiday. Traditionally, Beltane festivities began days before May 1st or "May Day," when villagers traveled into the woods to gather the nine sacred woods needed to build the Beltane bonfires. The tradition of "May Boughing" or "May Birching" involved young men fastening garlands of greens and flowers on the windows and doors of their prospective ladyloves before the fires are lit Beltane night. As with many Celtic customs, the type of flowers or branches used carried symbolic meaning, and much negotiating and courting could be worked out ahead of time. Many communities elected a virgin as their "May Queen" to lead marches or songs. To the Celts, she represented the virgin goddess on the eve of her transition from Maiden to Mother. Depending on the time and place, the consort might be named "Jack-in-the-Green" or "Green Man," "May Groom" or "May King." The union of the Queen and her consort symbolized the fertility and rebirth of the world. The tradition of choosing a symbolic goddess and god as official participants in the Beltane ritual captured Marion Zimmer Bradley's imagination in her novel The Mists of Avalon. In Bradley's retelling of the King Arthur legend, the Beltane celebration is a sacred ritual involving a high-ranking male and female virgin to represent the God and Goddess. The god in this case is called the "King Stag"; he must run through the woods with a pack of deer, followed by his own huntsmen, and only after he has successfully locked antlers with and killed a stag that he can return to the festival and claim his right as consort to the Goddess. Other couples also celebrate in this way, but it is only these two who become the God and Goddess incarnate. Because the Celtic day started and ended at sundown, the Beltane celebration would begin at sundown on April 30th. After extinguishing all hearth fires in the village, two Beltane fires were lit on hilltops. The villagers would drive their livestock between the fires three times, to cleanse them and insure their fertility in the coming summer, and then put them to summer pasture. Then the human part of the fertility ritual would begin. As dancing around the bonfires continued through the night, customary standards of social behavior were relaxed. It was expected that young couples would sneak off into a ditch, the woods or, better yet, a recently plowed field for a little testing of the fertility waters. Even after hand-fasting was replaced by the Christian tradition of monogamous marriage, the Beltane ritual continued with a new tradition: all marriage vows were temporarily suspended for the festival of Beltane. Many a priest would lament the number of virgins despoiled on this one night, but the tradition persevered. Babies born from a Beltane union were thought to be blessed by the Goddess herself. Another use of the Beltane fires was for a purification ritual using a scapegoat or Fool. Special cakes made out of egg, milk and oatmeal, called bannocks, were passed around in a bonnet. One piece of bannock was charred, and whoever chose this piece was the Fool for that year's Beltane; it was believed that any misfortune would fall on the Fool, sparing the rest of the people. It is now generally believed to be a myth that the Fool was ever burned as a human sacrifice; this seems to have stemmed from Christian priests and their attempts to condemn Beltane festivities. Later customs called for the Fool to leap three times through the Beltane fire, and according to earlier customs the Fool was banned from all Beltane activity. Beltane, like Samhain, is a time when the veil between the worlds is thought to be thin, a time when magic is possible. Whereas Samhain revelers must look out for wandering souls of the dead, Beltane merrymakers must watch for Fairies. Beltane is the night when the queen of the fairies will ride out on her white steed to entice humans away to Faeryland. If you hear the bells of the Fairy Queen's horse, you are advised to look away, so she will pass you by; look at the Queen and your sense alone will not hold you back! Bannocks were also sometimes left for the Fairies, in hopes of winning their favor on this night. The maypole, which was either a permanent feature or cut in a ceremony during the gathering of the nine sacred woods, was a symbolic union of the God and Goddess. The maypole itself represented the male, a phallus thrust into mother earth, while the ribbons that were wound around it represent the enveloping nature of the woman and her womb. The maypole was usually danced after sunrise, when disheveled men and women would stagger back into town carrying flowers they picked in the forests or fields. 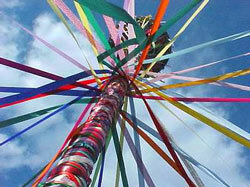 The area around the maypole was decorated with the flowers, and then the winding of the ribbons would begin. Sometimes the flowers were put into baskets and left on the doorsteps of people who were too ill or old to attend the Beltane celebrations. In this way, the entire town could participate in the joys of the coming spring. Neopagans already are well familiar with Beltane and its accompanying rituals. Some pagan groups have land on which they can host huge Beltane fires, with all-night dancing and frolicking outdoors. A quick look at the current events on Witches Voice around April or May will show many Beltane celebrations throughout the country. 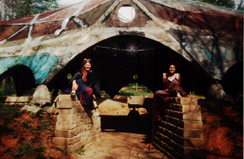 Among the offerings this year are Beltaine 2001: A Pagan Odyssey in Oxford, CT; the Mid-Atlantic Beltane Festival in Stanardsville, VA; Edinburgh Beltane in Edinburgh, Scotland; and FPG -- The Rites Of Spring (St. Petersburg, FL). All of these festivals includes a bonfire and a maypole. Most of them are multi-day events, with camping and workshops and general merriment and fun. The outdoor setting of these events makes nature and her flowering in springtime a more central focus to the May Day celebration. One such festival I attended several years ago at Lothlorien in Southern Indiana began with the rattle of chainsaws several days in advance, as the fire-tender prepared his surprises. Many of us were annoyed by this disruption in the lovely woods that covered the land on which we were camped. It was too modern, too technological for our tastes. When we saw the reason for the chainsaws, most of us forgave the noise. The festival began with the usual smudging at the door of the dome (where each participant is circled by a burning sage stick to cleanse them before they enter the ritual space). On one side of the fire pit was a wide log with a yoni cut out of its middle; the other side held a delicately carved phallus. The fire was struck from flint, and once the kindling had caught more yoni-shaped logs were brought in. We danced around the fire as yoni was stacked upon yoni. Soon a long, narrow piece of wood was brought in, and when it was thrust into the stack of yonis, our dancing reached a fevered pitch. The night went on like this, stack and thrust, and the fire became huge, with towers and castles created out of burning embers. Some chemicals were thrown on the fire, and different colors would streak up from the flames, hovering near the top of the dome. We danced (with some sneaking off to use their own yonis and phalluses) until dawn. As the sun came up, the fire tender picked up the finely carved phallus and lit the spinning firework on the tip. The fire tender held the phallus to his hips as sparks flew off of it and the drums pounded out an irresistible rhythm. As the sparks died down he thrust the carving into the yoni on the fire. Daylight broke over the dome, and the dancers collapsed in spent heaps around the dome, cuddling together for warmth in the morning dew. Speaking of morning dew, it is traditional to wash your face in the dew of Beltane morning. It is thought that it brings health and luck, and, in the case of young women, guarantees against fading beauty. 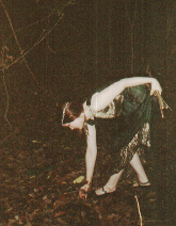 You don't have to be a Neopagan or have large acres of land to frolic in to celebrate Beltane. In fact, you may have already been a part of a Beltane celebration if you've ever attended a May Day party. 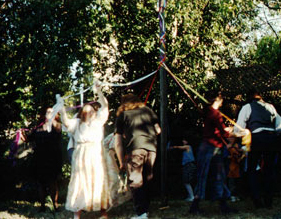 Throwing your own Beltane or May Day party is a great way to celebrate the coming spring. These days, a celebration of fertility does not necessarily mean your goals are human reproduction. Perhaps you have a garden that you would like to grow well this season; if you have a private enough yard (and a lover), making love in the garden is a way of honoring and insuring the fertility of the seeds you have planted. Make a wreath of flowers or fragrant herbs -- rosemary is a nice smelling one that tends to grow in abundance -- and weave a wreath for someone you'd like to know better. Or maybe there are projects you'd like to complete, goals you need to reach for, dreams you'd like to see realized. All of these things can benefit from the Beltane celebration of growth and fertility. Any Beltane party should have as many flowers as you can afford. If you have a garden, or a deck or porch with container gardens, you should include this as part of the party space and make sure you've planted your spring flowers in time for May 1st. Six-packs of spring flowers at your local garden store should run you no more than several dollars (and often less than two), and can add color and life to your Beltane atmosphere. You can even freeze flowers in the ice cubes for your punch. Edible flowers can add a fairy-like feel to your food table at a Beltane party. This site not only lists the types and tastes of edible flowers, but includes a delicious-sounding recipe for a Day-Lily Sorbet. Any fruit is appropriate for a Beltane spread, especially cherries, figs, mangos, peaches, pomegranates, and apricots, which have all been long associated with sensuality and/or fertility. Spring greens are another healthy way to imply fertility and celebrate springtime. Chocolate and other sweets are always a good means of tempting your guests at any Beltane party. Dancing a maypole is the most traditional way of celebrating May Day. Go to your local hardware store and buy a 20-foot wood pole (more rural folk can cut it themselves, but be sure to take a moment to honor the tree that gives the sacrifice). Ask your guests to bring their own ribbons, 20 feet in length and about two inches wide, in any color (and be sure to have several extras on hand anyway). At the party, tie all the ribbons to the top of the pole (you may want to buy an eye hook to make this easier) and plant the other end of the pole several feet into the ground. Have everyone form a circle, and count off in twos; have the "ones" face clockwise and the "twos" face counterclockwise. Have everyone grasp their partner's right hand, then pass them by on the right. Now, grasp left hands and pass by on the left. Then right, then left, and so on. Once you've made it once around the circle, pick up your ribbons and begin again, this time weaving your ribbons as you go. You'll want to have music once you start the actual weaving of the maypole. If you have talented friends who don't mind sitting out the maypole dancing itself (and certainly that's an option, especially if you're superstitious about pregnancy at this time of year), live music is the nicest way to go. This website has some songs that might be appropriate. Singing is good, too; if you choose to sing, you might want to consider sending out lyrics with the invitations, and sing the tune to your friends over the phone. This might be a good way to find out how much you can count on singing to carry the music 'round the maypole, too. we set the bonfires leaping. and we couldn't be found until the dawn came creeping. 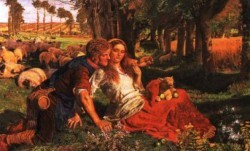 "The Hireling Shepherd" by William Holman Hunt. If you have the space and the zoning, have a Beltane fire after sundown. It should be lit from flint or friction, but matches can count as friction too. Again, drumming or singing around the Beltane fire is a traditional way to celebrate Beltane. Go around and talk about things in your life that you want to have grow in the following season. It might be your life's dream of becoming a painter, or your physical activity, or your relationship with a loved one. It might even be a baby you're trying to have; there's no better time than Beltane to ask the gods for fertility! Did it get a little warm around the fire last night? Were the flames a little higher than they had the right? and the moon too bright for sleeping? Heather Shaw is the Bookstore Manager for Strange Horizons. The Beltane Fire Society's website for their Beltane Fire Festival in Edinburgh, Scotland. A simple pagan ritual for Beltane. An excellent guide to Beltane for the solitary pagan. A database of Beltane songs with lyrics and sound clips! A look at surviving Beltane customs. A discussion of Beltane from the Isle of Avalon Knowledge Bank. A listing of Beltane symbols and customs. An overview of Beltane history and customs. Another excellent article on Beltane as a pagan holiday.